Duke Energy picks up Progress and nearly doubles its customer base for $26 billion. 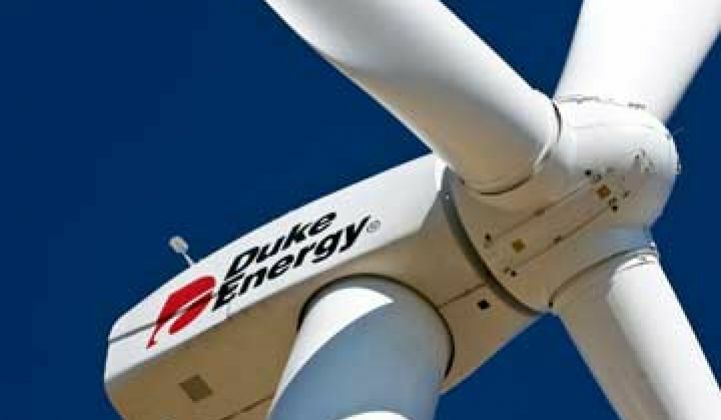 Duke Energy announced on Monday it will purchase Progress Energy for $13.7 billion and stock and take on $12.2 billion in debt in what will total a $26 billion transaction. The result will be the nation’s largest utility, if the deal gets approved. The merger, which still needs state regulatory approval, spans six regulated service territories (North Carolina, South Carolina, Florida, Indiana, Kentucky and Ohio), more than 7 million customers and will total 57 gigawatts of domestic generation capacity, with the largest nuclear fleet in the country. The headquarters will remain in Charlotte, where Duke is currently located, but Bill Johnson, the current CEO of Progress, will reportedly run the company, with Duke’s CEO Jim Rogers staying on as a board chairman. The marriage will mean that Duke will increase its exposure to regulated utilities from 75 percent to 85 percent of its business, according to the Wall Street Journal. Duke is a champion of smart grid and energy efficiency, but the announcement focused more on fuel purchasing and the dispatch of generating plants as the primary modes of saving money when the two companies come together. But Rogers did mention in a statement that new technologies will continue to be a priority. “Our industry is entering a building phase where we must invest in an array of new technologies to reduce our environmental footprints and become more efficient,” he said. The increased balance sheet is sure to fuel Duke’s interest in smart grid investment (and reportedly, more nuclear). At a Greenbelt conference just over a year ago, Rogers said his company was looking to own every piece of smart grid. The utility plans on spending $1 billion over the next five years to bring smart grid technologies to its customers. Duke currently is working with Echelon, Ambient and Cisco for its smart grid systems. Duke shares fell 2.04 percent in morning trading to $17.43, while Progress dropped 1.61 percent to $44.00.